Easy To Use. Lightweight. Good Value. Effective. Perfect for my needs. I use the Micro Mist Nebulizer's twice a day and they hold a large volume of medications. The delivery of the medications is swift and effective. I really do recommend the Micro Mist Nebulizers to any patient needing an effective delivery system for their medications. Good Value. Very good value.. Although it takes a little longer to atomize the albuterol, it is an extremely good deal compared to the oxygen rental place or the local pharmacy. It arrived promptly in good order and I got a shipping discount. I am again pleased and impressed with Allegro. Great Service, Just what I ordered ! Info hepled me look at and select this. Lightweight. Effective. Easy To Use. For use when I have asthma problems. Very easy to use. This my favorite setup. 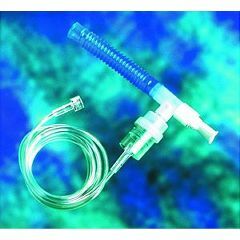 Nebulizer and tubing at an amazing price.